We’ve all been there. You click the New Post icon. The blank page sits in front of you, cursor blinking. You sit there, mind empty, trying to come up with a post idea that’s both fun and informative. If you sit there forever, and still can’t come up with something, you might be in an idea slump, and heading towards the dreaded blogging slump. I’ve been there before. I usually talk to some amazing blogging friends who will help me come up with ideas, but sometimes this doesn’t always work. So I’ve compiled a list of 30 ideas if you can’t come up with your own! Feel free to use any of these, they’ve been done before, and they’ll be done again. They aren’t all my “brand new ideas”at all- These are posts you’ve seen before. This list will help you IF you’re starting to feel like you’re in a blogging slump, which I’ve seen people saying more and more. 1. List the reasons why you started blogging. It’s pretty self explanatory, right? But I always find it interesting reading about peoples’ reasons for starting blogging. 2. Interview a fellow blogger. I love reading blogger interviews. They are so much fun, both to read and to write! Just contact a blogger friend or blogger you admire, and almost always they’ll be happy to participate. 3. Share your favorite childhood books. For me, a childhood favorite could be Percy Jackson or Harry Potter. I love reading about the books that bloggers loved as children. To do this, you’ll have to contact an author you’re interested in interviewing. Just shoot them an email, and they’d probably love to help! Just remember: Authors are really busy people, so don’t expect an immediate response. There are so many tags you could participate in: The Hamilton Book Tag, The Friends Book Tag… The list goes on and on, and they’re so much fun to write! 6. Write a review for your all-time favorite book. I love seeing bloggers flail about a book that is their absolute favorite, especially because I KNOW how hard it is to make that choice. 7. Have a blogger guest post for you. I love reading guest posts, and it’s awesome to be introduced to new bloggers that you might not have seen before! Just say on Twitter or on your blog that you’re looking for a blogger to guest post, and I’m sure you’ll receive lots of people willing to. 8. Write a discussion on a topic that you’ve been thinking about a lot lately. Discussion posts are probably my favorite to write AND to read. It’s a lot of fun to talk about your opinion on a topic and get others’ along with it! 9. Do a book recommendations post. Your readers can receive lots of books to add to their TBRs this way, and you’ll get to talk about some books you love! It’s a win-win situation. 10. Share your favorite quotes. I love quotes, and I literally have notes full of them. I’d love to read a blogger’s favorite quotes and see if any of them are the same as mine! 11. Talk about things you’d wish you’d known before you started blogging. There are a lot of things I wish I’d known before starting blogging, and a post MAY be coming your way on that soon. I’m really interested in what other bloggers wish they had known, so this could be a really interesting post! 12. Share some tips for new bloggers. I love sharing things I’ve learned and tips on this blog, and if you have things you’d like to say to new bloggers, do it! 13. Participate in a meme. There are so many weekly blogging memes you could participate in, such as Top 10 Tuesday or Waiting On Wednesday. 14. Talk about the book that made you a reader. Oh, this is a post I’d love to read. I think it’s really interesting to hear about this, and just think: What if you hadn’t read that book? 15. Make a playlist for a book. If you love music and matching songs with books, this could be the perfect post for you. 16. Write a personal update post. Talk about you! How are you? What’s been going on? Read any good books lately? I love reading personal posts on blogs I love and getting to know the blogger better. 17. Share some of your favorite blogs. You publish a post, and shout out blogs you love! Another win-win situation! This could really make a blogger’s day if they were mentioned. 18. Share some of your favorite blog posts from around the blogosphere. Talk about some interesting posts you’ve read lately. 19. List 20 facts about yourself. Another post in which you get to know the blogger better. It’s perfect! 20. Talk about the favorite and least favorite books you’ve read this year so far. Has 2016 been a year full of good or bad books for you? How are you doing on your reading challenge? Talk about it in a post! 21. Give tips for a social media you use for blogging. I recently gave tips for using Twitter, because that’s a social media I love to use for my blog, and if there is a social media you feel like you know about, make a post on it! 22. Write an open letter to something/someone. This is self-explanatory, and really fun to write. 23. Write a mini review for the last book you read. This could be such a surprise, depending on what you thought of the book. If you’re feeling generous, you could always host a giveaway on your blog! I recently did one for a 2016 preorder, and people really liked it. 25. Talk about your favorite TV shows. I am a huge TV show fan, and if you are too, recommend some TV shows your readers should watch! 26. Do a collab post with another blogger. Maybe write a collab review or discussion! This could be a lot of fun, especially if you do it with a blogging friend. 27. List the pros and cons of doing something. You could choose ANYTHING and make a post about it! You could answer a question such as “Do you prefer physical books or ebooks or audiobooks?” or “Do you prefer hardbacks or paperbacks?” There are literally thousands of choices out there. 29. Write a “If you liked this book, read this book!” post. You could help someone find their next favorite book! Especially if you recommend a less known book if you liked a similar popular one, you’re helping the author too. 30. Revamp/update an old post. 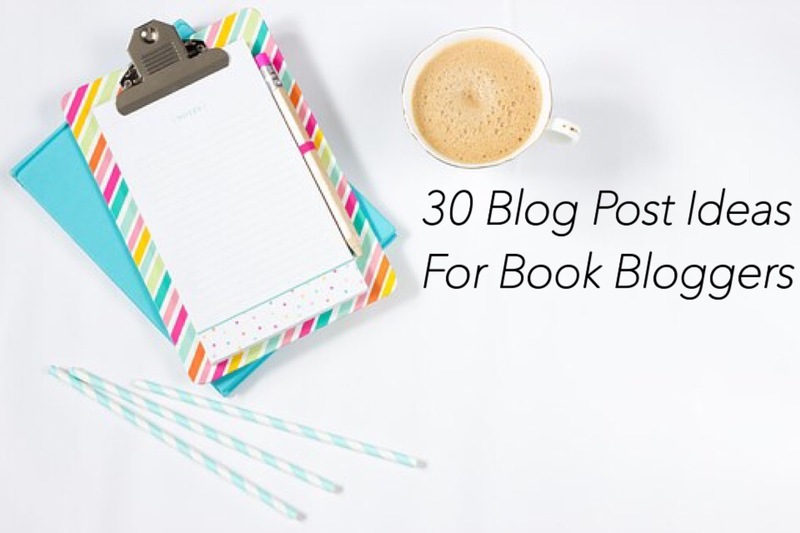 Go through your blog’s archives and find a popular post or one you enjoyed writing! Then write an updated version with new information, and most likely people will like it just as much. I hope this posts helps you when you can’t think of a post idea! Have you ever been in a situation where you couldn’t think of anything to post? What do you think caused that? How long did it take to get out of it? Comment below! Previous Post Do You Have The Time To Start A Blog? These are some really awesome ideas! Thanks so much for sharing!! literally bookmarking this post, so i have a constant flow of ideas for the upcoming school year!! That was such a helpful post! I’m actually planning the posts of October and November for my blog and some ideas were super cool! Thank you for this great post!! I was trying to think up a new blog idea and this really helped out!! This is wonderdul! Right now I’m just writing book reviews once a week, but I was actually thinking about expanding that now that I have a handful of posts underneath me (just starting out 🙂 ) Anyway, I like the variety of post ideas you gave, so many great ideas! Thanks for the ideas! Right now my blog, http://literaryweaponry.com, is strictly book reviews and I’ve been pondering how to expand upon that without being pompous. This list gave me several things to think about. This is really helpful, thanks for the post. Of course! I’m glad it helped. Like many others I came here for help and found it! Thank you so much for this post! Thank you so much, these suggestions are really useful! Thank you! I’m so happy this helped you out, that was my goal with writing it. 😉 If you need any other help, be sure to let me know! Great advice here! Bookmarking for sure. Thanks! And I use a free WordPress.com theme called Button. I like it, but I’m thinking about doing self-hosted so…who knows! If you need any other help, be sure to let me know. How do you attract attention to your blog? I’ve been blogging for almost a year now, which is part of it! It takes time. But I also tweet about it on my Twitter, hoping people will click the link and view my posts. Ok. Well, I hope you can check out my blog (which is not that great yet), and hopefully give me advice as to what I need to do to improve it. I would greatly appreciate it! Thanks you so much! These all amazing tips. Just going to write a post now! Thanks! I hope you do a post like that soon, and I can’t wait to see it! Great ideas, thanks for sharing! I’ve been thinking about doing movie/television reviews and if I’ve read the book, mini reviews of both book and movie adaption. Thanks! I hope you do movie and TV reviews soon, I love reading them! I loooooove this!!! So many good ideas! Yay, thanks! I’m glad you like it. Thank you so much! I’m so happy it helped you. Great list! For once, I’m feeling kind of inspired, and actually ahead of my blogging schedule a bit, but I know eventually this post will come in handy! Thanks so much! I’m glad it helped you. Yay! I’m so happy it helped you. If you ever need help coming up with more post ideas, just shoot me and email or dm on Twitter! Thanks, lovely! <33 yes, Twitter can be a FANTASTIC place to find ideas. And ps: I loved that post! These are some awesome recommendations! I’ve been trying to think up some new blog post ideas and this has really helped me. Thank-you! Thank you so much! I’m glad this post helped you. If you ever need help coming up with more ideas, just shoot me an email or dm on Twitter!